Detroit Fire Collective is a Circus community that revolves around a once a week Flow Jam open to the public. The Flow Jam is a place where both professionals and amateurs come together to share the knowledge and culture of fire spinning and circus play. Our mission is to provide a judgment free and friendly environment where people can practice their skills and learn how to use fire safely and responsibly. Our love is community, whether it be our own or the city we're submerged in, our goal is to support passion. The Detroit Fire Collective meets each Monday at Tangent Gallery - 715 E Milwaukee Street - Detroit, Michigan 48202. Admission is $5. Doors open at 7:30pm and close at 11pm. 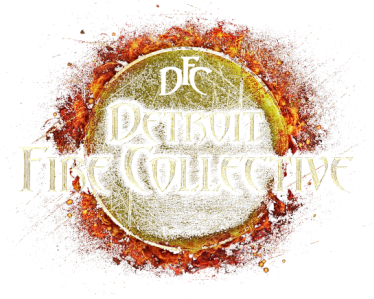 The Detroit Fire Collective is a substance free environment. We are open to newcomers, age 18+. We do make exceptions with under 18 with parent or guardian accompaniment. If you wish to spin fire please wear non-synthetic clothing. These materials include but are not limited to cotton, rayon, wool, leather, and silk. The DFC Facebook group page is also a space for flow artists and circus people to come together and share their knowledge or ask questions about the circus arts. Visit our facebook page by clicking here!